We now have our first look at Life is Strange 2, the next installment in DontNod’s episodic narrative video game series – and things got hairy pretty quickly. The first Life Is Strange was a surprise hit when it first landedon Steam back in 2015, putting players in the shoes of a troubled teenager with the ability to manipulate time. 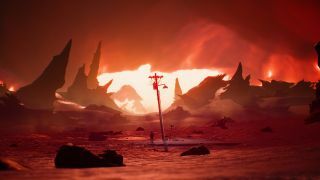 Marked by its weighty storytelling and smart gameplay mechanics, it’s since spawned a three-episode expansion called Before The Storm, and a free prequel game called The Awesome Adventures Of Captain Spirit that came out earlier this year. The prequel was a playful look at how a ten-year-old’s imagination and reality can collide, though it looks like Life Is Strange 2 will reintroduce some of the more explicitly paranormal elements that defined the first game’s mechanics. You can see the first clues of the game’s story in the trailer below, which sees an Oregon police officer calling for backup after reporting a ‘10-10’ – a fight breaking out, for you regular citizens – before the officer and his car are both thrown across the screen by an unseen force. There’s not much else to go on, but our first thought is some sort of telekinesis, vis-à-vis Eleven in Netflix’s Stranger Things. Given that the young Captain Spirit is set to make a reappearance, could we see the young superhero fanatic gain some real powers of his own? We also know that player decisions made in the free game will carry over and influence the story in Life Is Strange 2, so the game is likely to be similar in tone to what we’ve seen so far. While the September 27 release date for the first episode is already publicly known, the trailer points to August 20 for an official unveiling of the game and what it will involve – coinciding with the start of this year’s GamesCom event. Life Is Strange 2 is set to come to PC, Playstation 4, and Xbox One.